See the recent press for the Montefiore Fine Art Program and Collection both locally and abroad! Don't forget to follow our instagram at #montefiorefineart to stay up to date with all new installations, exhibitions, opportunities, and awards. DayDreams: An Augmented Reality Art Installation located in the main lobby and gardens of the Montefiore Moses Campus was chosen for inclusion in CODA Magazine's Experiential and Interactive Art Issue for September 2018. The Gallery of ARTFul Medicine exhibition "Connecting People, Strengthening Communities: The Harlem River Bridges", featuring the photography of local artist Duane Bailey-Castro, was featured on Bronx Net News for the opening reception at Hutchinson Metro Tower 1 on July 26th, 2018. The exhibition will be accessible to the public until December 2018. Come visit today! The Norwood News writes about "Grow Your Own Food, A Declaration of Power", an exhibition featuring images by photojournalist Marisol Diaz capturing the work by Activist and Farmer Karen Washington. The Montefiore ARTViews Gallery exhibition "Growing Your Own Food, A Declaration of Power" showcasing the work of farmer and activist Karen Washington and photojournalist Marisol Diaz was featured on Bronx Net News! Come visit the exhibition today at our Montefiore Moses Campus located at 111 East 210th Street, Bronx, NY 10467. The show will be up until Labor Day Weekend. The first virtual reality painting created for Montefiore Medical Center by Tom Christopher was featured in Forbes Magazine. The piece highlights the Virtual Reality Art Program at Montefiore and our efforts to employ fine art to help reduce pain, anxiety and opioid use in pediatric cancer patients. 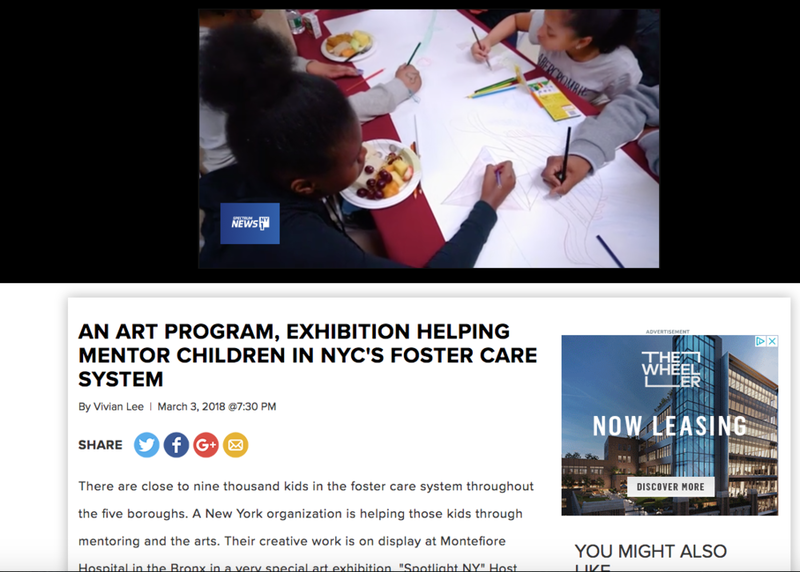 The Montefiore ARTViews Gallery exhibition with Foster Pride was featured on NY1! Click here to view the video! "There are close to nine thousand kids in the foster care system throughout the five boroughs. A New York organization is helping those kids through mentoring and the arts. Their creative work is on display at Montefiore Hospital in the Bronx in a very special art exhibition. "Spotlight NY" Host Vivian Lee introduces us to "Foster Pride." Watch "Spotlight NY" on Spectrum News NY1 every Saturday and Sunday at 7 p.m. and 10 p.m."
Thanks to your votes, likes and shares, Montefiore’s Fine Arts Department received the Innovation in Healthcare Award from pptArt Corporate Awards. 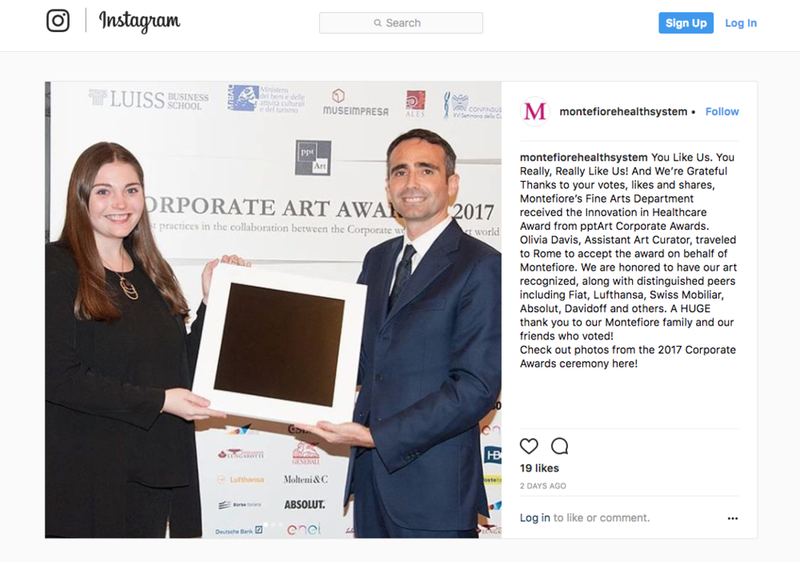 Olivia Davis, Assistant Art Curator, traveled to Rome to accept the award on behalf of Montefiore. We are honored to have our art recognized, along with distinguished peers including Fiat, Lufthansa, Swiss Mobiliar, Absolut, Davidoff and others. A HUGE thank you to our Montefiore family and our friends who voted! Named “One of NYC’s 4 Top Charities” by CBS.com, Foster Pride has helped over 10,000 children in foster care build life skills, increase their self-esteem, and prepare for aging out of the foster care system, by creating mentoring relationships and engaging them in art and career-oriented programs. The HandMade Program was born out of a simple request from a social worker to teach the young women living in her group home how to crochet. Today, five years later, the program has grown into an opportunity for these talented young women to create and market their own line of crocheted items, which have been sold at Nordstrom’s, American Eagle’s pop-up shops, and the Paris boutique, Milk on the Rocks. Students keep 100% of the proceeds from sales and develop life skills and a sense of entrepreneurship that helps them in their future careers. For this exhibition, the young women in HandMade worked with their instructor Amy Stack, and guest crochet artist London Kaye, to “yarn bomb” various sites in the Bronx. Dubbing themselves, “The NEW Bronx Bombers,” they had a ball exploring this new aspect of artistic expression. "Crochet made by London beautifully and passionately. Thank you, London!" "Wonderful time. Wonderful hospital. Enjoy the crochet." "A Life without colors isn't worth living!!!" "Beautiful crochet to inspire hopes and dreams at Montefiore." "Thank you, London, Montefiore and Foster Pride for this beautiful installation - it brightened my day!" The ARTViews Gallery Fall/Winter 2017 exhibition "Say it with Flowers" featuring artwork by Linda Stillman is featured in the Riverdale Press on December 1st, 2017. The article highlights features of the exhibition as well and thoughts from the artist and Curator Jodi Moise. Almost a year later, Stillman’s exhibition, “Say it With Flowers,” is now on display at the Montefiore Medical Centers’ ArtViews Gallery, 110 E. 210th St., through Jan. 26. At the first floor of Montefiore Medical Center’s radiation oncology department, a collection of photos stretch across the hallway featuring everyday people holding flowers. The photos, part of an exhibit, intends to calm the nerves of those whose anxiety kicks up at a center where results can be life-altering. The photos were taken by Linda Stillman as part of an exhibit dubbed “Say it With Flowers,” presented by the hospital’s Fine Art Program and Collection. The Montefiore Fine Art Program and Collection has been nominated for the 2017 Corporate Art Awards. Every year the Awards aim to enforce visibility, recognition and reputation for best practices in the collaboration between the Corporate world and the Art world. The ceremony is Wednesday, November 22nd in Rome, Italy so wish us luck! Click here to see Montefiore amongst some of the world's best businesses. Our Gallery in the Gardens show entitled DayDreams: An Augmented Reality Art Installation, featuring the work of photographer Shuli Sade, on BronxNet! Tom Nussbaum featured by CODAworx for Starry Night, an installation at Montefiore's Pediatric Psychiatry Center. "Starry Night is a site-specific commission created by New Jersey artist Tom Nussbaum for the out-patient psychiatry practice of the Farrand Building Rehabilitation Center in The Bronx. The piece is comprised of acrylic on steel, wood and paper. The dimensions are 2 feet tall by 9 feet wide. Additional elements include four acrylic on steel sculptures that are placed throughout the waiting area of pediatrics. The artwork and sculptures as a whole create an immersive installation that welcomes patients, families, and staff everyday."